Yes, there is life after dark in Lion City. Our pick of Singapore's coolest bars, fun pubs, discos and eateries for all stripes. Soap up and step out for some fun with foam. IT’S no Ibiza or Berlin, but the island nation of Singapore, despite its sober image, is not a sleepy town when the lights go out. From cool cocktail joints in converted convents, to cool sky-high bars, and dancing girls in seedy Bangkok-style clubs, there’s a boozy establishment to suit most, no matter your nocturnal proclivities. Clubs, mostly spinning electronic dance music and some attracting the talent of big-name DJs from Europe and elsewhere, remain fairly popular among a younger set. A competitive environment and fickle patrons, however, have meant that most clubs don’t stay open for more than a handful of years (Zouk, a Singapore nightlife institution since the early 1990s, is a singular exception). Trendy cocktail and wine bars are now all the rage, with intimate speakeasies and alfresco drinking spots popping up all over the city. Pubs and live bars are a touch less common, though a few old faithfuls are still dotted across the island. Like many Asian countries, karaoke is a beloved pastime, and if you fancy a turn behind a microphone, there are karaoke bars of all stripes – from sketchy to swish – to choose from, mostly with private rooms to sing and drink in (gratefully) away from the public eye. Wander into any karaoke bar past midnight on a weekend and expect to overhear forgotten hits by Heart and The Bee Gees belted out with reckless, tone-deaf, abandon. Thanks to an exorbitant “sin” tax, alcohol can be pricey in Singapore, with cocktails and even pints of beer sometimes costing more than US$20 a glass (US$1 = S$1.40). If you’re hoping for a cheaper tipple, most hawker centres (outdoor food courts serving up scrumptious and cheap local nosh) will sell the Singapore original Tiger beer, a light and frothy lager, for a handful of change. Copy the old gents with smouldering cigarettes dangling dangerously from their mouths as they pour your beer over a mug of ice. Sacrilege? Trust us, it’ll help beat the sweltering heat and make that Tiger somewhat zingy. Speaking of the heat, if you’re craving a cold one at the beach on a hot evening, feel free to imbibe. But be sure to toss your can (in a bin) at the strike of 10.30pm, after which drinking is banned in all public places till 7am. (In the areas of Geylang and Little India, public drinking is prohibited from 7am on Saturdays to 7am on Mondays. The ban, enacted in 2015, also applies in those two neighbourhoods from 7pm on the eve of a public holiday to 7am on the day after the holiday.) During proscribed hours, don’t expect to be able to buy alcohol from convenience stores, supermarkets and other retail outlets. Only restaurants, bars and pubs with the appropriate licensing will sell booze at those hours. Smoking is also banned in most indoor joints and some public spaces, including parks, hawker centres and entrances of most buildings. Look out for designated smoking areas or risk racking up one of Singapore’s famous fines. Doesn’t sound like too much fun anymore? Read on for some of the city-state’s most hoppin’ after-dark spots, and see how Singapore really lets its hair down. For jaded travellers, hotels are sometimes the most convenient spots for an evening tipple or tucker. If you’re suffering from a major hangover, better still. There’s Hai Tien Lou, serving up tasty Cantonese cuisine, at Pan Pacific, Jade (where dim-sum and wasabi prawns are a must, www.fullertonhotels.com) at The Fullerton Hotel, and the Regent’s Basilico, which boasts a a scrumptious antipasto buffet complete with a cheese room piled high with hefty brie wheels and Manchego chunks, and soft and crusty breads of all varieties. One of the best hotel bars in town is the darkly chic Manhattan bar at The Regent hotel (www.regenthotels.com), with its elegant black-leather-sofa arrangement with pin-point lights, clubby alcoves, and 'aged' cocktails that stand in small wooden casks. Manhattan’s food menu is worth peeking at. Divided into sections devoted to New York City neighbourhoods, the food options range from the filling (soul food in Harlem) to the snackish (hot dogs inspired by the Theatre District’s roadside vendors). Each section also has a dedicated range of cocktails, meant to be paired with the grub. Shangri-La's BLU Bar (re-emerging in new livery May 2017) is another favourite, or scoot heavenwards to New Asia Bar, located on the 71st floor of Swissotel The Stamford. Fullerton Hotel's Post Bar offers chic indoor settings as well as alfresco pours, while sister hotel Fullerton Bay knows how to throw a decent party at its rooftop Lantern bar with its glass-panelled peekaboo swimming pool and grand views. Lantern is a good spot for the evening laser light show too. But if you care to venture out – and you must – there’s much to see and do. It could be dinner in a chemistry lab, dessert in army barracks (not for deserters though if you'll pardon the pun), drinks at a post office or tearing up the dance floor surrounded by 360-degree panoramic views of the city… in that order. Now that we have your attention, on with our Singapore nightlife trawl and a look at some cool bars and hip watering holes, ranging from informal nosheries to starched-linen establishments, boozy beer halls, hilltop belvederes and beachside venues. Restaurants often close by 10pm or 11pm, but bars and clubs can stay open till the wee hours. 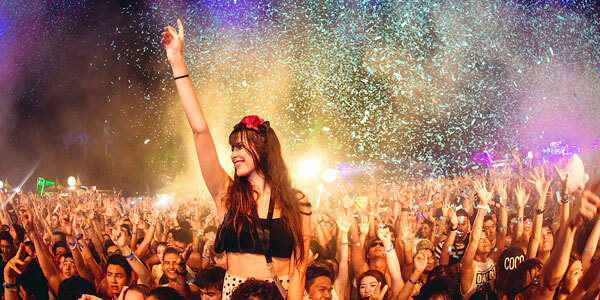 Don’t fret, partying doesn’t have to stop until near dawn. Orchard Road may be more known for attracting shopaholics than party animals, but there are plenty of choices for after-work meets. Just off Orchard Road is the Tanglin Village cluster. 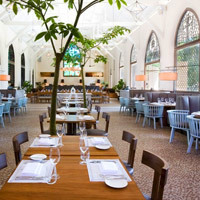 The former British army barracks and nutmeg plantation has been infused with new life since its redevelopment in 2007 – a laid-back, cool crowd throngs the restaurants, cafes and bars. It’s more like a pre-party stopover. To get there, hop into a cab or take buses 7, 75, 77, 106, 123,174 and 502 from Orchard Road. Turn into Dempsey Road and you’ll come across an assortment of local fare atop the low rise. Pop by the famous Samy’s Curry (an institution at Dempsey, www.facebook.com), or seafood restaurants, Long Beach (www.longbeachseafood.com.sg) and Jumbo (www.jumboseafood.com.sg). 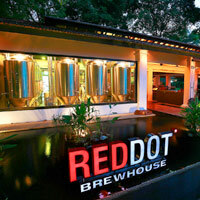 Also on the same stretch is Reddot Brewhouse (www.reddotbrewhouse.com.sg), where you can swig home-brewed hops. Grin and beer it. 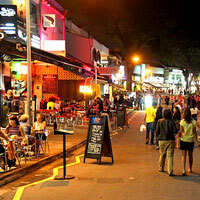 Dempsey Hill (25A Dempsey Road, tel: 6475-0500, www.dempseyhill.com) houses the majority of the bars and restaurants. House (8D Dempsey Road, tel: 6475-7787, www.dempseyhouse.com), occupying a duplex and comprising a spa, café and bar, is one of the main tenants. The café and bar – aptly named Barracks and Camp – are suitable for informal gatherings. Start at Barracks for dinner and dessert (some of the dishes come served in metal containers to evoke those old military memories) and head to Camp for some cocktails and thumping rhythms after. A DJ is on hand to spin trance music. If you’re fortunate, you might be able to snare one of the outdoor sofas facing the forest. It’s a nice tranquil touch. Hacienda (13A Dempsey Road, tel: 6476-2922) is one of those places to spend a lazy evening indulging in slowly-sipped drinks and lengthy chit-chats. The garden-themed bar (complete with swings and lounge chairs that double up as sitting areas) specialises in fresh fruit martinis and if those don’t get you high, try the swings. Blu Kouzina (10 Dempsey Road #01-21, tel: 6875-0872) is a new kid on the block, but already one of the most hopping spots for dinner. And with good reason. The Greek restaurant, bedecked in traditional blue and white, serves up some of the best Mediterranean food on the island. Call ahead if you want a shot at a table. Trot down Dempsey Hill and you’ll arrive at PS Café (28B Harding Road, tel: 6479-3343, pscafe.com) a favourite with the well-heeled in search of some casual downtime. If you’re planning on having dinner, it’s wise to make a reservation. Or drop by slightly later in the night to dig into their desserts – the lime pie is a must-try. Farther down the road is chapel-turned-restaurant, The White Rabbit (39C Harding Road, tel: 6473-9965, www.thewhiterabbit.com.sg). 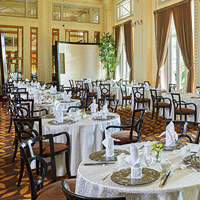 It offers fine dining without the usual stuffiness, thanks to its high ceilings coupled with a bright and airy atmosphere. Hallelujah. Get your fix at the open-air bar – The Rabbit Hole – once you’re done sampling the classic European fare. Also nearby is Open Farm Community (130E Minden Rd, tel: 6471-0306), Singapore’s closest thing to a “farm-to-table” restaurant. Sitting on a plot of 35,000sq ft of urban farmland, the 60-seat restaurant is beautifully rustic and sunlit, and serves up tasty and wholesome cafe food. Expect lots of herbs and vegetables, most of them grown on the property itself, as well as an array of meat, seafood and pasta dishes. Orchard Road used to be home to some of the most happening nightspots in town in the ’90s– namely Sparks disco at Ngee Ann City and Venom at Pacific Plaza. Sparks has since vanished into the mists of time while Venom (later re-branded as Chinablack) was sold off in 2000. The owners of Venom came back with Club Silk, which quickly turned into Club Aura (opened November 2010, tel: 6737-7455) at Orchard Hotel. Adjacent is Orchard Towers (notoriously nicknamed “four floors of whores”) where nightlife borders on the recklessly risqué. If you’re feeling bold, Naughty Girl (ahem), a rock and roll bar located on the second floor, is something of an institution. Otherwise, keep your hands firmly tucked in your pockets and stride by quick. Some of the pretty young things sport bobbing Adam’s apples and deep bass voices with a Thai accent. Perhaps not someone you’d bring home to mother. A more buttoned-up option in the neighbourhood is Horse’s Mouth (tel: 6235-1088), a “hidden bar” at Forum the Shopping Mall. To find it, step into Uma Uma Izakaya Restaurant, a casual ramen joint on the first floor and take the stairs – obvious but unmarked – down a flight. There, you’ll find a dimly-lit cocktail bar with dark wood finishes and sumptuous sofa chairs. Order one of the excellent cocktails on the ever-changing menu or simply ask the bartender to concoct something special. For food, you can order cheap but good Japanese grub from the ramen restaurant upstairs. Down the road is one of Singapore’s best and oldest dive bars, Cuscaden Patio Cafe & Pub (tel: 6887-3319), located in the rather dilapidated Ming Arcade. It might not look like much but it’s a cosy place with cold pints, tasty wings, good company and plenty of classic rock. In 2016, Cherry (www.cherryclub.sg), a trendy hip-hop club, opened its doors in the basement of York Hotel. It's since become one of the city’s hottest nightspots among the younger set, and is always packed to the brim on Friday nights. 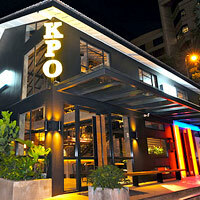 Past Orchard, in the Somerset area, you’ll spot KPO (1 Killiney Road, tel: 6733-3648, www.imaginings.com.sg), short for Killiney Post Office. Part of this two-storey building still runs as a post office by day, while a larger section of it has been converted into a watering hole smack in the middle of a busy downtown intersection. It is near impossible to find seats on weekends, but patrons are undeterred. It is common to find starch-shirt yuppies posing outdoors, chugging beer and ogling all the long-legged eye-candy. Despite its location, you won’t suffer coughing fits and stinging eyes from the cars whizzing by. And it can get surprisingly breezy on some nights. This is one establishment that does not permit smoking even in outdoor areas: you have to be content with lighting up around an ash-tray atop a rubbish bin standing unceremoniously outside the main entrance. 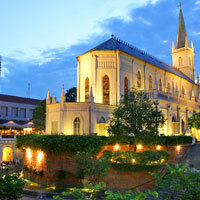 The post office may have stamped out smoking but it has certainly put its stamp on the Singapore nightlife scene. Get there post haste. Acid Bar and Alley Bar at Peranakan Place (www.peranakanplace.com) on Emerald Hill are also favourites for those in search of a more watered down alternative to the usual bustling, noisy nightlife. This district is a blend of old world charm and city slick when it comes to nightlife, bars and entertainment. Chijmes (30 Victoria Street, tel: 6337-7810, www.chijmes.com.sg) – a convent school in the past – is all colonial grandeur on the outside. But behind its cloistered walls, lining a pretty courtyard and fountain, are a host of restaurants and bars. Club Refuge (chijmes.com.sg/refuge) is the place to go for hip-hop and R&B music, and live bands play Monday through Saturday nights at Berlin Bar (tel: 6333-4036). Watch sports and grab a pint at Harry’s pub (tel: 6337-0618), or sip on bespoke cocktails at Single Cask (tel: 6837-0953). For fine dining, popular Cantonese restaurant, Lei Garden (01-24, tel: 6339-3822) holds court in a lovely position overlooking a courtyard. Here it’s dim sum with a garden view. 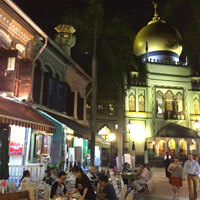 A useful Singapore dining choice with local flavour. For Japanese grills, there is Gyu-Kaku (01-01, tel: 6333-4001), which dishes out delectable barbeques. A short distance away from Chijmes is Odeon Towers (331 North Bridge Road) where you'll find Loof (03-07, tel: 6338-8035, www.loof.com.sg), a rooftop bar with a cool, lazy vibe. While you can afford to dress down a little, it is one of the to-go hang-outs of the trendy crowd. If you want to size up the landscape of Singapore at a glance, take the elevator up 71 floors Swissotel The Stamford to New Asia Bar (tel: 9177-7307, www.swissotel.com), which gives you sweeping views of the city skyline. The view is especially enthralling at night when the buildings and street lamps are lit. 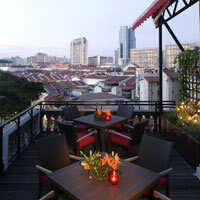 But New Asia Bar is not all about admiring the view; choose to chill out over wine or bump and grind to the beat. Music played here is a fusion of the old, the new and the kooky. You might find yourself having to shake and shimmy to Bollywood-inspired rhythms. There are also firmly- grounded alternatives for those with a fear of heights: Introbar (tel: 6837-3322) and Anti:Dote (formerly Ink Bar) (tel: 6431-6156) on the first levels of Swissotel The Stamford and the neighbouring The Fairmont respectively. A new, and must-visit, landmark in the vicinity is the stunning National Gallery Singapore (1 Saint Andrew’s Road, tel: 6271-7000), which is housed in two national monuments – the former Supreme Court and City Hall – that opened its doors in 2015. After admiring the art on display (it’s the largest public collection of modern art in Southeast Asia), head upstairs to the roof for a treat. There are two bars up there – the cosy cocktail joint Smoke and Mirrors (www.smokeandmirrors.com.sg)and the swish Aura Sky Lounge (tel: 6866-1977), located above sister restaurant, Aura, which serves pricey but tasty Italian cuisine. 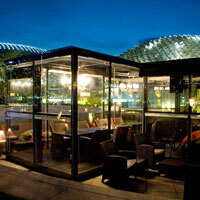 Both bars have unobstructed views of the Padang, a green playing field where rugby and cricket have been played since the nascent days of colonial Singapore, and the flashing behemoth that is Marina Bay Sands. Also in the National Gallery is National Kitchen by Violet Oon (www.violetoon.com), a gorgeously furnished restaurant helmed by one of Singapore’s most renowned chefs. Violet Oon has three restaurants in Singapore – all of them excellent, beautiful and dishing up lip-smacking Peranakan fare (a unique mix of Chinese and Malay cuisines, full of hot chilis and thick coconut milk). The National Gallery location is the most fancy of the three with its dark wood furniture, mirrored walls and shimmering chandeliers (the other two are in Bukit Timah, a homey spot, and Clarke Quay – trendier and focused on skewered satay, or meat kebabs). Save some space for the fantastic, and unexpected, cocktails which are mostly inspired by local flavours, like the “Baba Negroni,” made with rum instead of the traditional gin, local herbs, and muddled spicy ginger. This is the spot for a classic night out in Singapore, old fashioned, slow, and surrounded by great vintage decor and authentic Lion City aromas. East and south of City Hall is Marina Bay, a cluster of malls, hotels, office towers and tourist destinations, including the towering shopping-hotel-casino complex that is Marina Bay Sands, known as MBS, and the botanical wonderland, Gardens by the Bay. There are plenty of watering holes in the area to keep you sated. CUT by Wolfgang Puck is a favourite. A pricey American-style steakhouse in MBS, the restaurant’s bar serves up similarly pricey but tasty, stiff cocktails (if peckish, the bar also has to-die-for desserts on offer, including a local version of a Baked Alaska with kaya, or coconut jam, and pandan sorbet). If it’s a fresh bay breeze you’re after, head heavenwards to Spago (tel: 6688-9955) located on the 57th floor, also an establishment linked to Puck, the Michelin-star celebrity chef (Puck’s Spago in Beverly Hills is a favourite among the Hollywood set). Though you likely won’t be spotting Justin Bieber in Spago Singapore on a regular basis, the fine dining restaurant, and its linked terrace lounge, have their own appeal. The outdoor lounge is especially enjoyable with its good cocktails, cozy loungers and perfect panoramic views of the city. If you’re looking for a bit more action, the restaurant, club, and tourist trap, CÉ LA VI (formerly Ku De Ta, sg.celavi.com) is a neighbour of Spago’s on the 57th floor. The overpriced cocktails and beers might cut deep, but the 360-degree vertiginous views are worth the splurge. Suntec City, Millenia Walk and Marina Square are three malls in the vicinity, filled with shops and a handful of places for a tipple. Paulaner Brauhaus (9 Raffles Boulevard, tel: 6883-2572, www.paulaner-brauhaus.com/singapore) at Millenia Walk is a decent spot to slosh down some icy beer and catch up with your mates. The German pub is decked out with long wooden tables and benches, shiny copper pipelines and brew kettles. 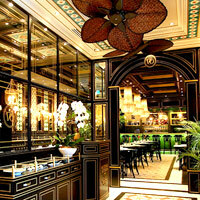 The result is a no-frills, down-to-earth atmosphere that is homely and inviting. Another no-frills drinking spot is Bistro 1885 (tel: 6836-5994), a self-described “urban gastropub” at Suntec City Tower 4. There, you’ll find an impressive array of wines, as well as a selection of craft beers and choice liquors. The pub fare is nothing special, but decently tasty. Southwards towards the water again is the durian-shaped concert venue, the Esplanade. Want a drink to take the edge off a dull play or a yawning piano recital? There are a number of drinking holes in the area to knock back a few. 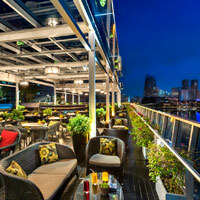 Check out Orgo (8 Raffles Avenue, 04-01, tel: 6336-9366, www.orgo.sg) located at the rooftop terrace. You not only get to take in the glittering sights of the bay, but also get to sip custom-blend cocktails by a Japanese mixologist. Mischief (tel: 6532-0481), a mostly-outdoor eatery serving up tasty “American street food” (think nachos and tacos, burgers and fries), is a good choice for inexpensive buckets of beer, good margaritas and pitchers of sangria. For foodies craving local fare, there’s also Makansutra Glutton’s Bay (8 Raffles Avenue, 01-15, tel: 6336-7025, www.makansutra.com) where hawker grub is peddled until late. Across the bridge from the Esplanade is One Fullerton, a dining and shopping complex located right on the bay across from Marina Bay Sands. Overeasy (tel: 6423-0701, www.overeasy.com.sg), a popular waterfront bar there, is hip with a hint of slouch – patrons, usually dressed to the nines, lounge languidly on long sofas facing the bay, sharing bottles of wine and downing cocktails. The Central Business District (CBD) was never known for its party scene, but with big-name clubs and bars opening in the CBD, and plenty of hip drinking holes emerging on its edges, the area is becoming quite the nightlife hotspot. There’s the trendy 1-Altitude (1 Raffles Place, tel: 6438-0410, 1-altitude.com) – the world’s highest alfresco bar – at the top of the 282m the OUB Centre. Drop by to catch a glimpse of the city lights or try your hand at concocting your own drinks. Other sky-high options are Empire (tel: 9336-1443) and Skyline (tel: 9128-7001), both located on the 45th floor of Singapore Land Tower at 50 Raffles Place. 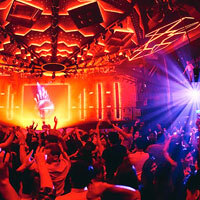 Club Kyo (133 Cecil Street, tel: 8299-8735) is one of Singapore’s hippest clubs. Thursday night is ‘Ladies Night’, when women drink (some things) for free and the house DJ spins hip hop and old-school R&B. In the nearby Telok Ayer area, a cluster of trendy cocktail bars have emerged, including Bitters & Love (tel: 118 Telok Ayer Street, tel: 64381836), Jigger & Pony (101 Amoy Street, tel: 6223-9101, www.jiggerandpony.com), Sugarhall (102 Amoy Street, tel: 9732-5607) and Employees Only (112 Amoy Street, tel: 6221-7357), where serious bartenders shake and stir colourful custom cocktails to perfection. Operation Dagger on the adjacent Ann Siang Hill (7 Ann Siang Hill, tel: 6438-4057) is another excellent cocktail spot. 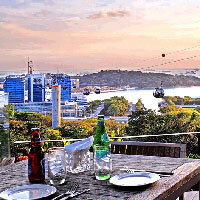 Ann Siang Hill and its offshoot, Club Street, are littered with several other cool bars and restaurants. The rooftop bars Breeze (33 Erskine Road, tel: 6511-3323, www.thescarlethotel.com) at Scarlet Hotel and La Terraza Rooftop Bar on the roof of Screening Room (12 Ann Siang Road, tel: 6221-1694, www.screeningroom.com.sg) should put a smile on your face and get you started for an evening trawl. Lolla (22 Ann Siang Road, tel: 6483-1228, www.lolla.com.sg) is a wine bar and restaurant with a whimsical, feminine feel. Crystal decanters and cans of tomato paste line the shelves of the upstairs bar, while sunny indie pop music bops in the background. The basement has an industrial chic vibe, with a 22-person communal table, cool cement walls and a separate champagne bar. But the best and brightest bubbles aren’t all that’s on the menu. Don’t leave without trying the sea urchin pudding, which pairs well with a glass of the Marie Demets Brut. Other nibbles include tuna belly “chutoro” tartare, Tasmanian grass-fed Rib Eye and a fresh, simple tomato salad. A short drive away is 28 Hong Kong Street (www.28hks.com), a plain white building which houses one of Singapore’s best watering holes. Enter through the unmarked beige door, push aside the dark curtain and step right up to the black marble bar. The drink list has as much character as the New York-inspired surrounds, with cocktails like “Whore’s Bath” and “Corpse Reviver No 2” stirring up a word-of-mouth following. If you’re not sure what’s what on the esoteric menu, the smart servers will guide you through the menu without a hint of pretension. Along the Singapore River, from the CBD area towards Orchard Road, are three “quays”: Boat, Clarke and Robertson, each home to many restaurants and drinking holes, though each unique in vibe and crowd. Boat Quay used to be one of the leading nightlife entertainment districts in town but that has changed. It has faded over the years, leaving behind a seedy sheen and while a handful of bars and coffee shops still line the waterfront, it’s no longer a top choice for after-dark fun in Singapore. There are, however, a couple of places in the vicinity that might still be worth popping into. There’s Timbre@ The Arts House (1 Old Parliament Lane, tel: 6336-3386, www.timbregroup.asia), with its laidback vibes and live music, and Boomerang (52 Circular Road, tel: 65364990), a no-frills Australian bar and bistro popular among expats for an after-work pint. The bar, which also has a location in Robertson Quay, hosts trivia nights every Tuesdays and Thursdays, and screens sports – ranging from rugby to Formula One – on its large TVs. For more action, the very fun Mad Men Attic Bar (11 North Canal Road #03-02, tel: 6222-3629) is located just a hop and skip away. Friday nights are always hopping, with an excellent live band playing contemporary and classic hits. 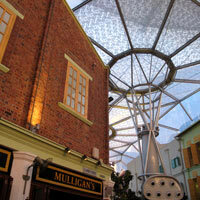 On to Clarke Quay (www.clarkequay.com.sg), the often-crowded home of a myriad bars, pubs, restaurants and clubs. Clarke Quay used to be the place to be if you wanted to be in the heart of the action, but like Boat Quay, this former nightlife hotspot has lost some lustre in recent years, as many once-popular drinking holes and eateries have shut their doors while other neighbourhoods around the city have jostled to emerge as the new party central. But it seems that Clarke Quay might be getting its mojo back. In November 2016, six new nightlife establishments and F&B spots opened in a flurry in the area, including Zouk (3C River Valley Road, zoukclub.com), Singapore’s oldest club and a name synonymous with the local nightlife scene. Zouk moved into its new Clarke Quay location after 25 years in its iconic, misshapen and sprawling building on Jiak Kim Street. Local club goers have expressed uncertainty as to whether the club can survive the move, but so far, Zouk remains crowded on weekends, with party lovers, young and middle-aged, cramming its two rooms – the main one, which hosts resident and international DJs spinning a variety of electronic dance music; and Phuture, a smaller room dedicated to hip-hop and R&B. Other new tenants include Warehouse (#01-09, Block C, tel: 6337-5585), a live music venue that hosts popular cover band Tania five nights a week, and Maziga Cafe and Club (#01-10, Block C, tel: 6235-7307), an Indian-fusion eatery meets Bollywood club. Also at Clarke Quay is Attica (01-03, Block A, tel: 6333-9973, www.attica.com.sg), another of Singapore’s longest-standing clubs. 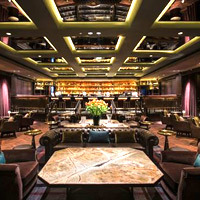 First opened in 2004 and heavily patronised by the expat crowd, the venue is split into four sections: two levels of the club itself, and two outdoor spaces – The Courtyard, a chillout area, and the newly-renovated Bar Rose, a champagne and martini bar overlooking the Singapore River. Other crowd-pullers include The Pump Room (01-09, Block B, tel: 6334-2628, www.pumproomasia.com), a microbrewery, bistro and a bar rolled into one smart package, and Shanghai Dolly (01-01, Block B, tel: 6270-7676, www.stjamespowerstation.com), a cabaret-style club featuring live Mandopop shows. Across the river at Riverside Point (meander over the pedestrian bridge at Clarke Quay to get there) is Brewerkz (301 Merchant Road, tel: 6438-7438), a microbrewery and restaurant serving up a range of tasty craft beers and American-style cuisine. The nachos, piled high with melted cheese, salsa, jalapenos and guacamole, are dangerously moreish. Further down the river, you’ll find Robertson Quay, the last of the three quays once synonymous with the best Singapore nightlife but now past their prime. You won’t find any booming clubs here; just a pleasant variety of restaurants, cafes and bars by the river. The most popular among them is Wine Connection (11 Unity Street, #01-19/20 Robertson Walk, tel: 6235-5466), a wine retailer and bar/restaurant with both indoor and outdoor seating. It’s a good place for larger groups looking for a laid back vibe. La Maison Du Whisky (80 Mohamed Sultan Rd, #01-10, tel: 67330059) is a cosier drinking spot, serving up prime spirits, including a large range of rare and specialty whiskies. Those with a sweet tooth would love Laurent’s Café & Chocolate bar, located right next door (80 Mohamed Sultan Rd, #01-11, tel: 6235-9007). The cafe has a room dedicated to delectable truffles. Their Pure Chocolate Cake is not for the faint of heart. By the waterfront you have Brussels Sprouts (01-12, The Pier, tel: 6887-4344, www.brusselssprouts.com.sg), where you can sample Belgian beer and dig into fluffy Belgian waffles, and the new concept cafe, restaurant and retail space, SPRMRKT (41 Robertson Quay, #01-01, Tel: 6221 2105), located down the road. The outlet spans two floors: on the second is SPRMRKT Kitchen + Bar, a restaurant serving good meat and seafood dishes, pastas and tapas-style small plates. Downstairs is SPRMRKT Daily, a more casual eatery known for its brunch options. Leaving the downtown and CBD area, we now head south to the island resort of Sentosa, which had already a hotbed for nocturnal escapes even before the Resorts World hotel-casino combine came along. Beach bars dot the coastline ranging from pseudo-huts to faux resorts. Siloso Beach is home to riotous (by Singapore standards) New Year's Eve foam parties with a soapland pool for a sensuous slither, loud music, and fireworks. Soap suds appear, under the radar, every once in a while. Watch the nightlife adverts. If you refuse to change out of your shorts and flip-flops, there’s Coastes (tel: 6274-9668, www.coastes.com) on Siloso Beach with its rustic wooden tables and chairs. Tanjong Beach Club (120 Tanjong Beach Walk, tel: 6270-1355) is an island favourite, with its blaring electronic dance music, beach cabana beds and outdoor pool. Don’t rule out hotel bars just because they don’t sit atop the sand. Bob’s Bar by the pool at Capella is not only understated and classy; it also boasts one of the island’s prettiest sea views and is a great spot to catch the sunset. Indoor alternatives include The Hard Rock Hotel bar, which stands out with its uncluttered, monochromatic décor. And if frolicking on the beach isn’t enough, the Wave House (30 Siloso Beach Walk, tel: 6377-3113, www.wavehousesentosa.com) will certainly crank up the adventure factor. Surf 10-foot manmade waves, get inebriated and prowl the dance floor all in one night, in one place. There is more to the harbourfront area than VivoCity… like yachts. These million-dollar boats are usually docked in remote corners of the city, but not anymore. At Keppel Bay – Singapore’s only private island – you can unwind with a glass of chilled wine with sleek yachts within sight. Privé (2 Keppel Bay Vista, tel: 6776-0777, theprivegroup.com.sg/prive), which comprises a bakery, a bar and restaurant, occupies a fair stretch of waterfront at the clubhouse. Cajole and beg to bag a sofa that faces the dock. There is something strangely comforting about gazing at laundered white yachts bobbing on the waters. Take the MRT and alight at Harbourfront. From there, grab a cab for the five-minute drive to Keppel Bay. 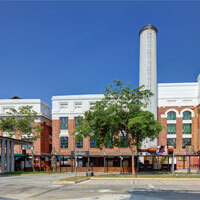 St James Power Station (3 Sentosa Gateway, tel: 6270-7676, www.stjamespowerstation.com), the imposing, red-brick building right beside the causeway leading to Sentosa, was once an entertainment powerhouse packed with myriad clubs, karaoke spots and bars; but the nightlife venue has recently become more synonymous with danger than dancing. Fights and scuffles are known to frequently break out in the wee hours, and in 2016, a group of men was arrested after hurling Molotov cocktails at a club there. A few months later, a guest was stabbed to death by a waiter – a rare and odd murder in a country with extremely low rates of crime. Still, if you aren’t troubled by the trouble, St James still has 10 nightspots under its roof, including Rupee (www.rupeestjames.club) a popular Bollywood club, and Club Hollywood (tel: 6270-7676), a Thai discotheque. Round the corner of harbourfront is Mount Faber, the third-highest point in Singapore at 106 metres. 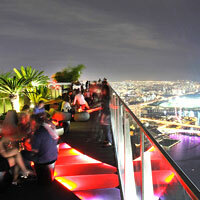 There are quite a number of rooftop bars in Singapore, but hilltop bars? Faber Bistro (formerly Sapphire, 109 Mount Faber Road, tel: 6377-9688) at the peak of Mount Faber is probably the only hilltop bar in Singapore at the moment. And it doesn’t disappoint with its starry views, crisp air and cool breeze. Nowhere will you find a more bohemian, hippy vibe than in Holland Village, a name synonymous with Singapore nightlife, though more for its upscale yet informal restaurants. This is a posh residential district. 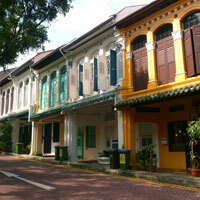 The clustered shop houses have much to offer with a wide variety of bars, restaurants and cafes. Even a wet market and hawker centre situated right smack in the middle of it all doesn’t dilute its unique charm. Wala Wala (31 Lorong Mambong, tel: 6462-4288, www.walawala.sg/) is one of the first bars and live music venues in the area and funnily enough, quite family-friendly. It is common to see kids munching pizzas and parents swilling beer. Its unpretentious, no-frills approach ensures just about everyone feels comfortable hanging out here. Next to Wala Wala is the slightly more swish Tango Restaurant and Wine Bar (35 Lorong Mambong, tel: 6463-7364). An assortment of cuisine, from Mexican to Lebanese to Korean, can be found here. Across the road from Holland Village is Chip Bee Gardens where a row of quality dining outlets are to be found. Try well-regarded Original Sin (01-62 Chip Bee Gardens, 43 Jalan Merah Saga, tel: 6475-5605, originalsin.com.sg) that serves vegetarian fare Mediterranean style. Rochester Park, off Holland Village, is also worth a visit. Colonial bungalows set amidst lush greenery have been refurbished as fashionable watering holes and eateries. One Rochester (tel: 6773-0070, www.onerochester.com) is suitable for knocking back a few shots and gulping down potent mixers. And then there are those places that don’t fall into any neatly defined districts, but should still be jotted down in your diary. A crop of new bars and restaurants have popped up all over the former red light districts of Chinatown, especially along Jiak Chuan and Keong Saik roads. Converted old shophouses along these cobbled lanes have retained their charming heritage looks, aside from some splashes of bright paint. For some Latin flavour, try the friendly and trendy Esquina Tapas Bar (16 Jian Chuan Road, tel: 6222-1616, www.esquina.com.sg) on the corner of Jian Chuan and Teck Lim roads. Inspired by modern Spanish dishes, the kitchen whips out an array of savoury small plates such as roasted padron peppers, beetroot salad, beef tartare, baked bone marrow. Wash it down with sangria. Insider tip: the restaurant doesn’t take reservations, so head there on a weeknight to avoid the crowds. Next to the Naumi Liora hotel is a ‘secret’ speakeasy called The Library (47 Keong Saik Road, tel: 6221-8338, www.speakeasy.com.sg). Despite the mysterious vibes, it’s not too hard to find. 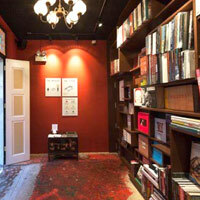 When you enter the foyer, which resembles an old-school Chinese apothecary, you’ll be directed to pass through a false wall lined with books into a small mirrored room. Push through the door and step into a dimly lit space that has all the makings of a fantastic bar: creative drinks, friendly bartenders, and comfortable seats. The concoctions aren’t your typical ‘mixology’ garble, either. Drinks are served in copper mugs, silver tins, porcelain teacups, or miniature bathtubs. Yes, that’s correct. The “Shrub-a-dub-dub” shareable drink comes complete with bathtub gin, spiced apple bubble bath and a glow-in-the-dark rubber ducky. For a completely different scene, head to Arab Street, where the alleys are lined with shisha dens, makeshift tables, and friendly faces. Look for a quirky little pub called Bar Stories (2nd floor, 55-57 Haji Lane, tel: 6298-0838, athousandtales.com) perched above the crowded streets, where each cocktail is bespoke, based entirely on the drinker’s preferences. Longplay (4 Haji Lane, tel: 6291-3323) is another nice cocktail spot in the area. The drinks are stiff, the tapas-style snacks tasty and the vinyl records play all night. 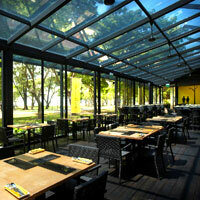 Canopy Garden Dining & Bar (1382 Ang Mo Kio Avenue 1, tel: 6556-1533), an Australian-style café, sits at the entrance of Bishan Park II and provides you with the relaxing option of cooling off with a glass of wine after a bout of cycling or jogging. If you’re not into cocktails with fancy names and unpronounceable bar snacks, there’s a solution. Do it the Korean way at 2 Days 1 Night (291 New Bridge Road, tel: 6227-6033), a soju-bang (a “soju room” or more loosely, a bar) on Tanjong Pagar Road. Dive into generous hotpots of hearty, spicy Korean stew and wash it down with soju, the Korean version of sake. So here’s the rundown of some of the to-go places when the moon comes up in Lion City. That’s all the Singapore nightlife and cool Singapore bars that can be crammed into a snifter. Cheers!